At a press conference in NYC, Verizon, Motorola and Google have jointly unveiled the latest Droid device – the Droid X. An announcement no doubt timed to take some of the spotlight away from the iPhone 4 launch, if only for a day, the Droid X will be Motorola’s eleventh Google Android-based device. With a 4.3 inch display, 1Ghz processor, eight megapixel camera and up to 40GB of memory (8GB on phone + card), the Droid X will surely provide some stiff competition for HTC. The Motorola Droid X also features three mics for ambient noise cancellation, 720p HD video capture, Flash 10 support, tethering and WiFi. 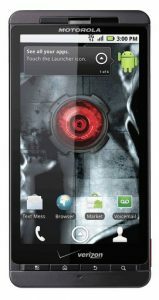 The Droid X is set to ship on July 15 for $199.99 with Android 2.1 and will only be available on the Verizon network, and unfortunately for Canadians, only in the U.S. Check out the “Verizon DROIDX Never Miss” teaser below.